during a sight-seeing-tour through austria last year, i took some extra pictures of various sights for panorama-stitching. 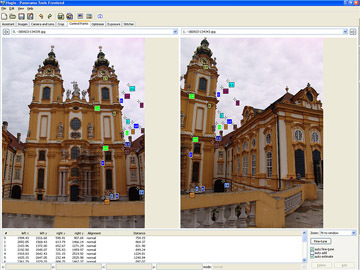 there’s a powerful panorama photo stitcher called hugin, that makes things very easy – and it’s open-source! i took a set of 11 pictures (not using a tripod!) 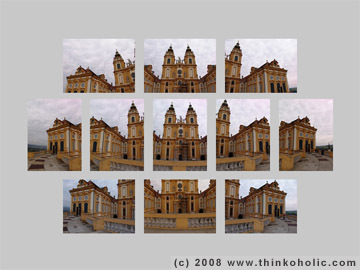 to get a complete view of the collegiate church at stift melk (melk abbey), austria. importing them into hugin, all i had to do was specify an estimation of the horizontal field of view (it’s automatically recognized from newer cameras), and hugin started computing away. the last thing to do was checking the keypoints and remove bad ones (if there are any). the only post-processing necessary for the resulting panorama was to crop the image, and (in this case) colour the very bottom of the image so that the otherwise black background wouldn’t stand out. Wowwowwow Markus!! Turning already pretty photos into super pretty panoramas!!! NICE!! i did not know ivrpa.org, but i’Ve heard of similar websites before. it’s cool what you can do with just a few images and the right kind of postprocessing! think i’ll look into the making of interactive 360° panoramas!